Organizations thrive or struggle as a result of interactions among team members. To optimize the performance of teams, Group Dynamics and Team Interventions bridges the gap between the most up-to-date academic research findings about group behavior and real-life practice. Chapters summarize the theories behind group and team behavior while offering proven application and intervention techniques that can be utilized in workplace settings. Topics addressed include team formation and development; understanding culture and team diversity; improving team cohesion, decision making, and problem solving; managing and reducing team conflict; team leadership, power, and influence; and others. Brief case studies and interventions that illustrate each theory help to enhance the clarity of the topics. 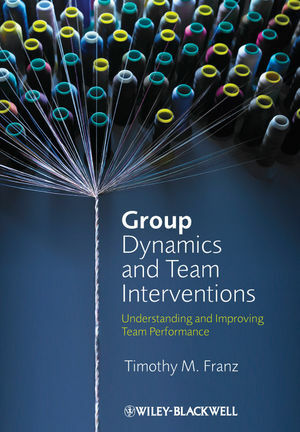 Group Dynamics and Team Interventions will benefit academics and practitioners alike, who gain from a better understanding of the dynamics that inform team behavior, along with assessment tools and practical intervention techniques to create and maintain a high-performing team. Timothy M. Franz is a Professor of Psychology at St. John Fisher College. His area of expertise is small group and team processes. In addition, he is an experienced applied researcher, specializing in conducting focus groups, interviews, and surveys. He has published in journals such as the Journal of the American Medical Association and the Journal of Applied Psychology.